The Scout is Yukon's compact high-power spy glass spotting scope that provides unique, high quality viewing at an affordable price that delivers 30x magnification with a practical, attractive, ergonomic design. Experience the fascination of nature at close range with the Scout series of high power spotting scopes. If you are interested in observing the wondrous world around you more intensely, for longer periods of time, and with greater magnification than that provided by most binoculars – this Scout scope is for you. 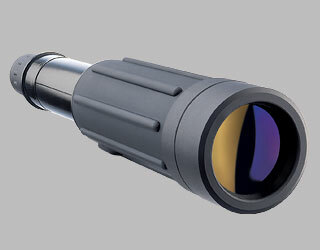 The scope's most distinctive features are its collapsible body and large 50mm objective lens. It is the perfect scope for beginners or experienced optic users, and the Scout makes a great gift. - Encased in durable, water resistant, rubber armor, the Scout can withstand rigorous use and can be used for both hand held and tripod use. The Scout's body can be retracted inward, reducing scope size, making it perfect for travel. - The considerable surface area of the 50mm objective lens provides immense light gathering capability, producing high resolution in a variety of lighting situations. Yukon's special multi-layered magnesium fluoride coating contributes to the sharp imaging.